Merry Christmas! 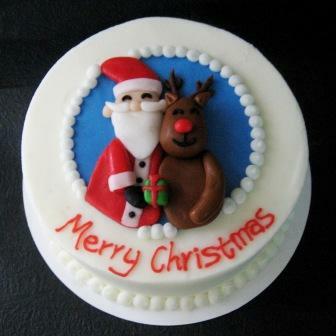 A 9-inch vanilla or chocolate Christmas cake decorated with Santa and Rudolph. The cake is single-layer and all decorations are hand-crafted with buttercream frosting and marshmallow fondant. Please specify vanilla or chocolate cake under the "Special Instructions" section. Please order at least 2 days in advance.